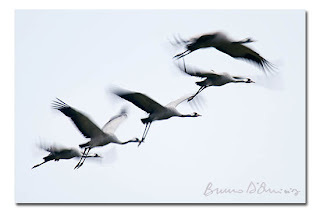 To Everything a Season: October is for Cranes! 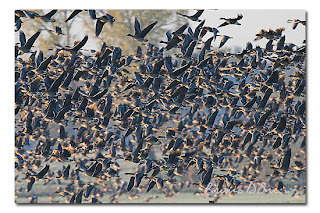 As it has already been for the last three years, mid October in North-East Germany means to me one word: "CRANES!" 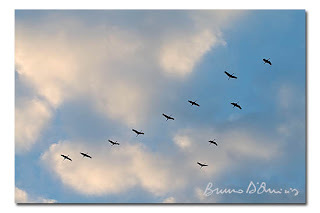 Indeed, as these beautiful large birds lead their autumnal migration toward Spain, they stop and gather in some traditional and quite well-known resting places along their way. One of these sites is in the area of Linum, a little village less than one hour drive from my apartment in Berlin. 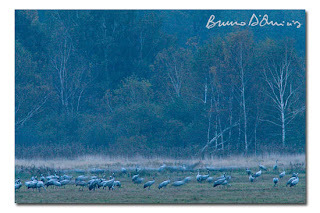 Trying to record on my pictures the spectacle of thousands of cranes (this year probably more than 80.000 in the peak day!) 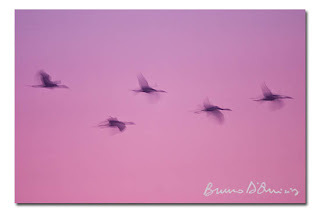 and wild geese taking off in the early hours of the day and flying against the faboulous morning sky just few meters above my head is an addiction I can barely control, and which keeps me waking up at 5am and drive 70km every day at least for a couple of weeks since the year 2005. 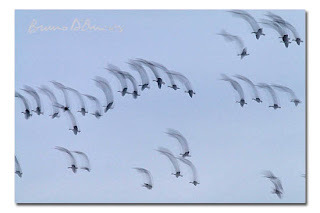 While being right at the roost site in the ponds is strictly forbidden and requires a special permission, it's nevertheless well possible to witness the morning take-off from many areas close to it, taking pictures of the flocks without disturbing this sensitive species. 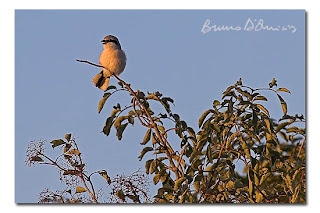 My favourite location is from an old country road, where, concealed by a camouflage net, I can photograph the birds quite close and enjoy the observation of many other charismatic species as well, such as the White-tailed eagle, Rough-legged buuzzard and the Great grey shrike among others. 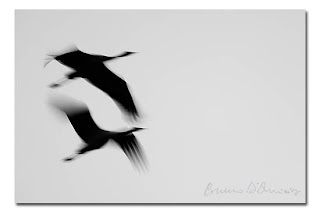 Despite the fact that the European crane (Grus grus) is probably and reasonably one of the most beloved and photographed bird species in the Continent, I think it is still well worthwhile to be at their presence with my camera equipment, playing with long shutter speeds and light to obtain something different and maybe more close to my own personal perception of the animal itself. 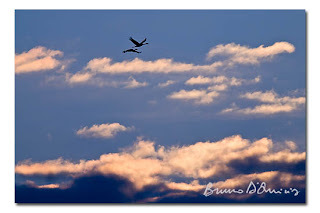 A unique bird the crane, which, while projecting its unmistakable silhouette against the golden dawn clouds and calling in the mist with its typical trumpet-like call, truly represents the realisation of my deepest longing for wilderness. oppure in primavera quando ripassano?